Submitted by denzil on August 11, 2010 - 1:57pm. In his message to SportsBandra '08, our patron, Leo Pinto pleaded "keep the fire (for sports) always burning (in our hearts)" ... we'll try and emulate your ideals ... always! Olympian Leo Hillary Knowles Pinto, the oldest living Indian sportsperson, passed away on Tuesday. He was 96. In 1936, Pinto was a certainty for the Berlin Olympics but missed it after suffering a serious concussion during the Olympic trials. He was India’s goalkeeper at the London Olympics in 1948 when India won the gold. Born in Nairobi, Pinto came to Goa and then Bombay where he studied at Antonio De Souza and St Stanislaus. He learnt to play hockey, football, cricket, badminton and boxing. He was also very good in athletics. At the age of 13, Leo, almost instinctively it now seems, took the decision to don pads and become a goalie. He played for Byculla Rovers in the Aga Khan Cup hockey tournament. Pinto had a good life with Tata Sports Club who made him manager of their hockey team even while he was playing. 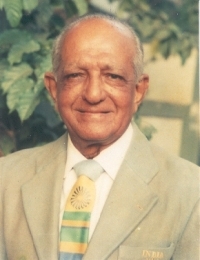 RK Vissanji employed him post-retirement at Wallace Flour Mills. In 1972, Pinto was coach of the Indian Olympic team and served on the Bombay Hockey Association in the 70s. He was also a good singer. Bach’s version of Ave Maria was a particular favourite. Submitted by Gerry Mascarenhas on August 10, 2010 - 9:37pm. I heard with great sadness of the death of Stanislite and Olympic Hockey goalkeeper Leo Pinto. Leo Pinto graduated from St. Stanislaus in 1932. His funeral was held in Bandra on 11th August 2010 at St. Francis of Assissi Church. He was buried at St. Peter's Sea Side Cemetary. Submitted by denzil on July 31, 2010 - 7:11am. Submitted by Gerry Mascarenhas on July 17, 2010 - 5:12pm. Francis D'silva and Michael Baretto are visiting Mumbai from Norway and it was yet another excuse for Class of 1977 and Junior College 1979 to meet over at Bandra Gym. While we had a great time we missed Mike Baretto who did not show up. The surprise was meeting with Milton D'silva. At the end of the evening Neale was threatening to start singing the School Anthem, Peter Tool forgot he was Peter Tool and mentioned he knew Peter Tool...go figure that one :) and ended up in Chembur dropping off Francis there with Christopher and Errol for company. I was too chicken to travel at that time of the morning with three "boys" in high spirits with Peter at the wheel. yes it was a real happy time. George Matthew was meeting a friend as the night was still young. Me, I hit the sack, I must be really getting old. Submitted by ashleymalcolm on April 24, 2010 - 12:32pm. My mother preserved an article from the Bandra Star regarding the War Heroes of 1971. I have enclosed a scanned copy of the same to add on to the history of stanislites (Armed Forces). My mother added an old pic of mine before scanning as the newspaper could not get my picture at the time of publishing.